Anyone who talks to me knows how much I evangelize Sean McMullen’s Greatwinter and Moonworlds serieses*. But his short fiction is a little newer to me; all I’ve ever read was “Eight Miles”, the story that kicks off Ghosts of Engines Past. I wasn’t quite sure what to expect, other than steampunk and engines. I knew McMullen was good at writing realistic technology as well as powered flight and sailing ships, and his novel Voidfarer extends that technology to spacecraft. One thing I wasn’t expecting, though, was just how much research the author had done to support the stories in the collection. Some pieces are annotated with something that boils down to “I tried this, and it really worked”; others (including one of my favorites, “Svyatagor”) must have taken lots of time and energy to nail down the details. Ranging from the distant past to the current present, Ghosts of Engines Past takes the reader on a journey through worlds of flight that never were… or at least never were quite the way they are in the stories presented. “Voice of Steel” — If you could tell scientists in the 1400s how to improve their inventions, what would change in the present? — I’m a huge fan of “change the timeline” stories (“Parallels” is one of my favorite Next Generation episodes), and this piece packs multiple shifts into a single weeks-long period in the life of one scientist. “Svyatagor” — What if the Russians had tried to land on the moon at the same time as the Apollo crew? — I think this one struck me because of the view of the Russian capsule in the film “Apollo 18”… but I also love stories where America fails to be the best at something, and if the Russians had landed first, how would that have affected the history books? “Steamgothic” — An eccentric ultralight engineer is brought in on a project to rebuild a steam-powered aircraft that crashed in 1952. — Mostly I got a kick out of how this story hung lampshades on steampunk and cosplay culture, but as we drew closer to the end I wondered what was going to happen with the steam plane. The ending was a little iffy, but the story overall was compelling. Other good entries included “The Constant Past” (a librarian discovers a serial killer using reference material to commit murder), “Tower of Wings” (a woman scientist in the Dark Ages wants to fly even as her castle is under siege), and “Electrica” (a British spy learns that an inventor — his countryman — may be concealing an even bigger discovery than his new communication techniques). And I have a special place in my heart for “Dragon Black”, a prequel to Souls in the Great Machine that, while possibly a little esoteric for those who haven’t read that book, is a nice piece of fill-in-the-blanks between Zarvora’s youth and her investiture as Highliber. Where the collection fell down for me was when stories got too long (“The Spiral Briar”, “Eight Miles”) or when I’d read pieces of alternate historical fiction already set in the same place McMullen set his (“Ninety Thousand Horses”). Your mileage may vary. As with his novels, McMullen’s writing is interesting, scientifically-accurate for the time/place it’s set, internally consistent, and — when appropriate — has tightly-written action sequences (my favorite being the duel in “Electrica”). McMullen’s variegated education (degrees in physics and history, a post-graduate degree in library and information science, and a PhD in medieval literature) and interests (formerly a professional musician; currently a black belt in karate) lend themselves to lots of really cool ideas; however, sometimes I felt as though his characters were trying to teach the reader instead of acting with their own agency. Several of the protagonists in the collection seemed to be drawn with a similar brush: British men of a certain age with deep knowledge of their chosen fields and excellent decision-making skills. It sometimes made the characters feel cool and distant — even Lieutenant Fletcher in “Electrica” and Leon Chandler in “Steamgothic” suffered from this, and they were two of my favorite characters in the collection. Ilya and Nikolai in “Svyatagor” were better-developed in that regard, and I think it was because the characters had to do something vital to their survival every moment they were on the page; Michelle in “Voice of Steel” was my favorite female protagonist because of how her character developed as the present changed. That’s not to say, by the way, that McMullen’s characters aren’t usually interesting; when he has a novel-length manuscript to work with, they’re fully-rounded and sharply-rendered. It’s just, working under the constraints of shorter fiction, a choice sometimes has to be made between the science and the characters, and the “British expert of a certain age” is an archetype we all know well. If you like steampunk, historical sci-fi (both alternate and not), the history of flight, or engineering, then I’d say this book is a must-have. The stories generally don’t have a ton of action sequences such as the ones you might see in a Cherie Priest novel, but if you don’t absolutely require those, I don’t think you’ll be missing much. What you get instead is an author who not only asks “what if it had happened this way?” but also does the research and presents a realistic, accurate view of what might have happened. And that alone is worth the price of admission. 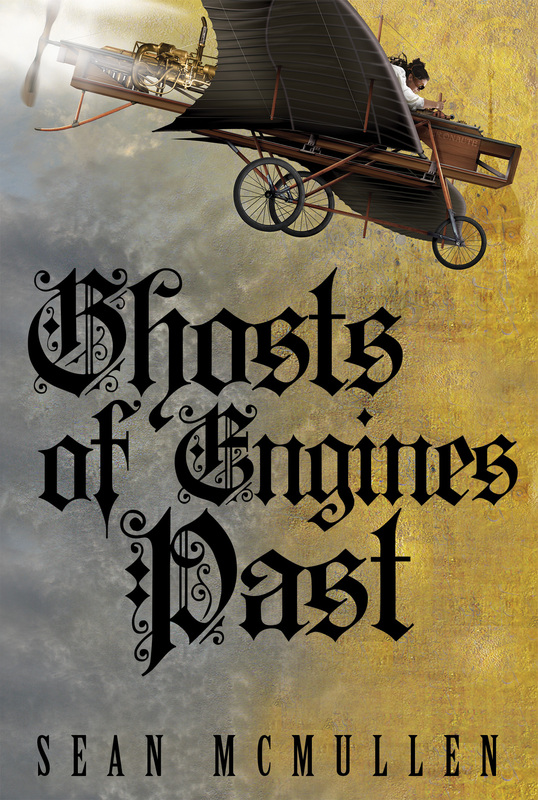 Ghosts of Engines Past is available in paperback and electronically, and was published by ReAnimus Press. Special thanks to the author for providing a review copy. Note to Parents: This book contains mild violence and language, as well as a few adult situations. Other than some occasionally-graphic (but scientifically-accurate) death and injury depictions, there is little to be found objectionable in this book. I would rate it as a hard PG or soft PG-13. Of course, you should use your own best judgment when it comes to your children. * I’m using the word “serieses” from here on out. Deal.